Brain-control interface technology is in the midst of a big coming-out party this year as it reaches the mass market for the first time in the form of a handful of games and toys. It also could be used to assist people with disabilities or test the efficacy of medical treatment and monitor patients. San Jose's NeuroSky is leading the charge with a half-dozen products, while rival Emotiv of San Francisco plans to start selling a mind-control headset in time for the holidays. The basic technology, which has been around for decades, involves reading a wide spectrum of brain waves and isolating patterns to understand moods and psychological states. From there, applications can be written to help understand the brain-wave profile and turn certain mental functions like heightened attention or meditation into catalysts for real-world actions. "This is the first time the technology is really venturing out of the medical lab into the real world," said NeuroSky CEO Stanley Yang. 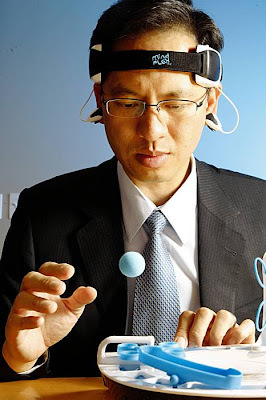 "This is the first time people can have brain-control interface technology as a consumer product." 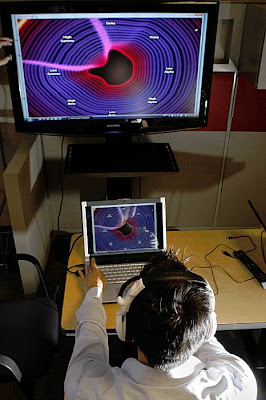 In the past, researchers were able to get at the brain wave data only through complicated and bulky headsets with dozens of sensors that required gels to facilitate contact. Companies like NeuroSky and Emotiv have been able to simplify the headset into a familiar form while whittling down the price. NeuroSky's MindSet sells for $199 while Emotiv's Epoc headset will sell for $299. When combined with an open software development kit, the technology has the potential to spread quickly among outside developers who can build a new class of accessible brain-control apps. 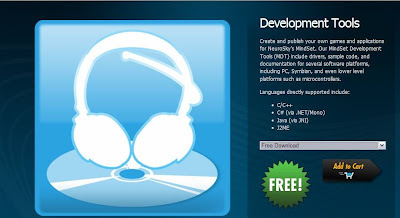 As reported earlier this week by Serious Games Source, NeuroSky announced that its MindSet Development Tools SDK is now available as a free download from its NeuroSky Store. Developers at NeuroSky released the software as a free download in response to requests from developers of serious game applications. According to SSG, NeuroSky communications Manager Tansy Brook informed that they are currently working with a number of partners like the Serious Games Institute in the UK, who are sponsoring beneficial games applications, but decided to make the MTD free to expand the opportunities for both Corporate and Independent Developers.